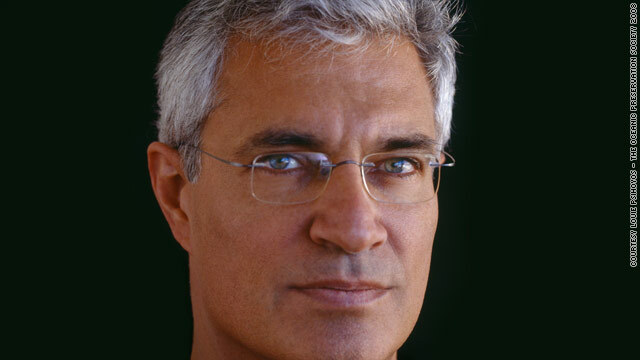 Louis Psihoyos, director of "The Cove" believes sea mammals should not be kept in captivity. (CNN) -- The director of an Oscar-nominated documentary about dolphin slaughter says the SeaWorld killer whale attack that left a trainer dead earlier this week could have been prevented. American Louie Psihoyos, director of "The Cove," which highlights the multi-billion dollar captive dolphin industry, said sea mammals should be left in the wild. "We join people in mourning this tragedy while keeping in mind that these animals don't belong in captivity," he said in a statement issued Thursday. "Our film 'The Cove' reinforces this notion that placing dolphins and whales in captivity is not an acceptable method of educating the public about these magnificent and normally peaceful animals," he said. Psihoyos's comments came after an employee at SeaWorld, in Orlando, Florida, died following an incident involving a 12,000-pound (5,400 kilograms) killer whale. The whale grabbed 40-year-old Dawn Brancheau's ponytail was and pulled her under water in front of shocked onlookers at SeaWorld's Shamu Stadium, according to police. Psihoyos, went on to say that the fact the whale, named Tilikum, had links to other human deaths was further evidence that marine mammals should not be kept in captivity. ... these animals don't belong in captivity. "The fact that this particular whale has killed others in the past is evidence of this, especially when considering that there are no documented cases of whales attacking humans in the wild," he said. "This is a tragedy that could have been prevented." In 1999, Tilikum was blamed for the death of a 27-year-old man whose body was found floating on his back in a tank at SeaWorld, the apparent victim of whale "horseplay," authorities said then. "The Cove," which won best documentary at the 2009 Sundance Film Festival and is competing for the Best Documentary at this year's Academy Awards. The film went on to spark an international campaign against dolphin hunting -- and controversy in Japan where the action is set. It depicts the annual butchering of the sea creatures near the Japanese coastal town of Taiji where dolphin hunts have been carried out for centuries. Upwards of 2,400 dolphins are captured or killed each year in the cove in Taiji, but more than 20,000 dolphins are killed in Japan annually, according to Psihoyos who is also co-founder of the Oceanic Preservation Society. Some of the dolphins captured at Taiji are sold to aquariums, parks and zoos, while the rest are killed for their meat.